A few weeks ago, we published a guide showing how to send reminders to authors before their content was published. One PublishPress user (thanks Andy McIlwain!) told us about their interesting twist on this technique. They send reminders to authors AFTER their content was published. And they also give them pre-filled social media links. All the authors need to do is click the links and they can share the post on social media. In this tutorial, I’ll show you how to set up similar notifications on your site. Now we get to the main content of the notification. There are sites that can help you generate social media sharing links. The one I used for this tutorial is sharelinkgenerator.com. Isn’t that easy? All the author needs to do is click “Tweet” to complete the process. 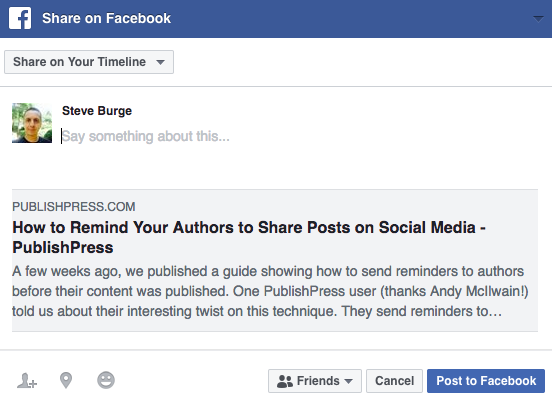 Hopefully this tip will save your authors a few clicks. 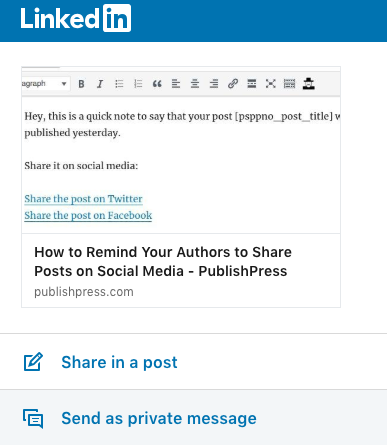 Send your authors a PublishPress notification after their content goes live, and make it easy for them to share it far and wide!